The Niki Charitable Art Foundation is delighted to announce the recent gift of a work of great historical and artistic significance by Niki de Saint Phalle to The Museum of Modern Art (MoMA) in New York. “Tir de l’Ambassade Américaine (Shooting Painting American Embassy), 20 June 1961” is a work created by Niki de Saint Phalle for a performance of the composition “Variations II” by John Cage. The composition was realized by David Tudor for the amplified piano on June 20, 1961, at the Theater of the Embassy of the United States in Paris. 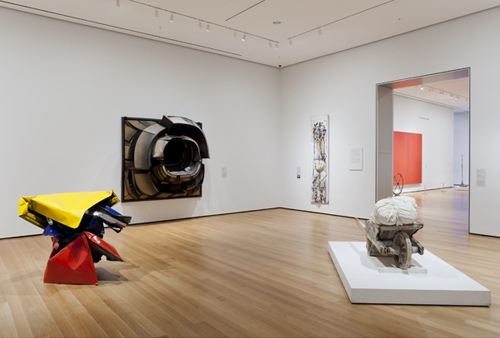 The décor for the performance was entrusted to Jasper Johns, Robert Rauschenberg, Jean Tinguely, and Niki de Saint Phalle. The shooting (“tir”) of the rifle in the creation of this work did not take place during the concert, but before. “Tir de l’Ambassade Américaine (Shooting Painting American Embassy), 20 June 1961,” given to MoMA in September 2011, is currently on exhibit on the fourth floor of the museum. Photos of the installation are by photographer Thomas Griesel. 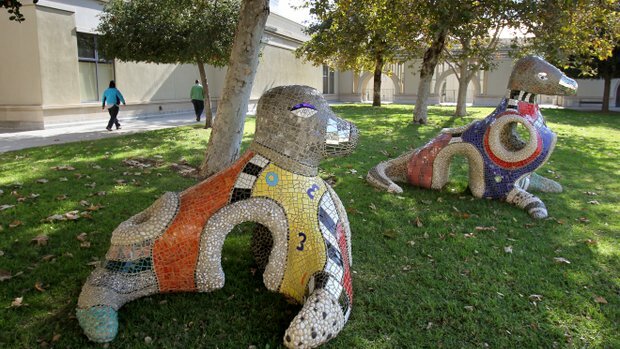 The front lawn of the California Center for the Arts, Escondido, grew a little brighter this week with the installation of four massive, colorful sculptures by Niki de Saint Phalle. The sculptures  a maternal totem, a cat and two seals  are on loan from the Niki Charitable Art Foundation for six months to a year, said Carina Courtright, president of the center’s board of trustees. “I specifically wanted to have people to see them from the street and bring color to the front of the center,” Courtright told the San Diego Union-Tribune. “They’re so joyful. … They kind of personify a lot of what we’re trying to do at the center  playfulness, fun activities and incorporating more things that draw people in.” Read more.